Ralph Coburn is not well known in Chicago —or almost anywhere—but deserves to be. Early in his seventy-year career, he created a series of paintings that hold their own besides those of his friends, Ellsworth Kelly, Jack Youngerman and Carmen Herrera. They are cool, abstract, geometric and, in Kelly’s word, “concrete;” they disdain realism, expression, metaphor and transcendence. But what is most remarkable is that Coburn’s multi-section paintings incorporate choice: the owner-curator is expected to rearrange the parts as she wishes. The idea, which has its origins in Dada with Jean Arp and the Bauhaus with Moholy-Nagy, was that meaning was not to be fixed by the artist but was the product of the interaction of artwork and viewer. That being the case, why not put the actual arrangement in the hands of the latter? 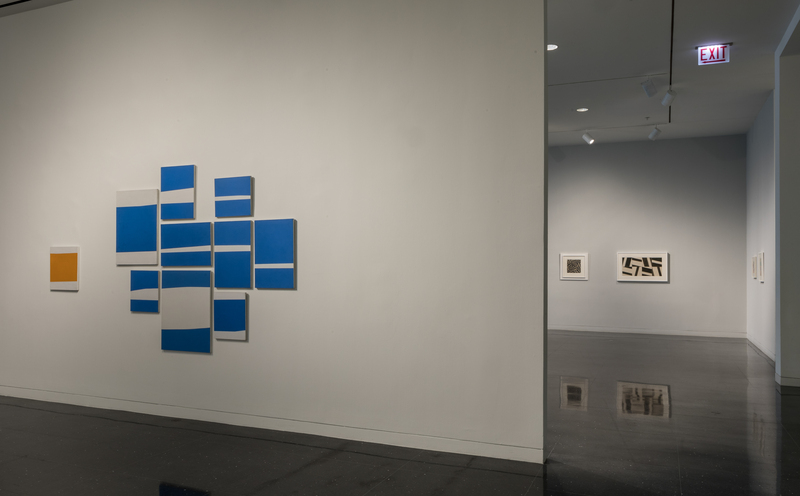 And that’s exactly what Coburn did in the most ambitious work of his life, “Premonitions” (1962), consisting of thirty-six canvases divided into seven groups, arranged by the owner/curator. The result is a colorful daydream that invites leisurely perusal, like Monet’s “Waterlillies” in the Musée de l’Orangerie. The difference is that Coburn is not interested in seasons of the year, times of day, growth, decay, duration, sky, water or mirroring. That’s a lot to sacrifice. 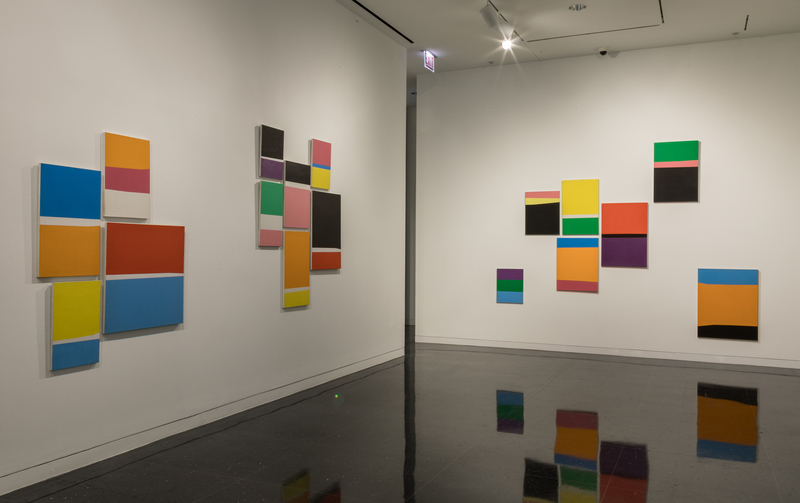 But the longer you look at “Premonitions,” the more you see: the canvases are nearly all vertical, composed of three colors, with uneven stripes across the middle. Most of the stripes are white, but two are black, two are orange, four blue, two rose, one purple and two yellow. Most of the arrangements have a vertical bias—a few even appear cruciform. The colors are mostly secondary, but a few primaries are evident. The canvas edges are painted white, making the ensembles flatter than they otherwise would be. Ralph Coburn’s “Random Sequence” shows through April 22 at the Arts Club of Chicago, 201 East Ontario.